Tell people you’re going to Lithuania and, almost without exception, your announcement will be met with a furrowed brow while they try to think exactly where it is. As part of the former USSR, the country only achieved independence in 1991 after several years’ struggle, so it’s perhaps not so surprising that western Europeans aren’t so familiar with its history or geographic location. Lithuanians are rightly proud of their country, and if you visit with a completely open mind, you’re in for something of a treat. The locals are friendly and welcoming, hotel and pub standards are generally high and there’s plenty to see and do. I flew with Czech Airlines, who offer an excellent service from Manchester, albeit via Prague. This wasn’t too bad going, but left me with six hours to kill in the Bohemian airport on my way home. I must admit I was rather dreading this, but thanks to a sumptuous executive lounge complete with wing-backed leather chairs and a grand gallery view of take-offs and landings, several dishes of nuts and olives and one or two ample gins, the time flew. These Prahans certainly know how to design an airport lounge – it puts some of the other international ones to shame, including several in the UK. On arrival at Vilnius airport, transfer by taxi (by far the easiest option) will cost around 50 to 60 litas (Lt) – around £11. There were other options, but whenever I get off the plane at any destination I just want to get to my hotel, and taxi always offers the quickest, most direct route. I’ve noticed that, in recent years, it seems the drivers are far less likely to haggle; the fare is the fare and that’s that. I suppose they’ve cottoned on to the fact that we’re all getting lazier, and we’ll give in in the end. And unless I feel I’m really being ripped-off, I’m never that comfortable with arguing over price – they do have a living to make after all and, as we all know, fuel costs are forever spiralling. If you’re making Vilnius your base, try to pick accommodation somewhere between the main commercial street, Gedimino Prospekt, and the beautiful old town. You should have no problem finding a hotel which suits your pocket – there’s the upmarket Radisson SAS Astorija where a double room will cost anything up to £130 per night, or at the other end of the scale you could choose the Ambassador (situated perfectly on Gedimino Prospekt, right opposite Gedimino 9 shopping centre, which even boasts an M & S to make you feel right at home!) which is a ridiculously cheap £22 per night for bed and breakfast (and that’s per room, not per person!). You may, like me, find this suspiciously cheap, but trust me – there’s absolutely nothing wrong with it and it is a real bargain. Incidentally, it’s well worth picking up your copy of a little publication called Vilnius in your Pocket. You can get it at almost any hotel or bar, and it’s an invaluable source of information (just don’t trust all its restaurant reviews – I feel the publishers may be in their advertisers’ pockets a bit!). The Lithuanian diet is geared up for cold winters, and therefore most of it is quite stodgy with a high calorific value. It’s great to try traditional food, but be prepared to gain a few pounds over the course of your stay. You might want to try zeppelins (stuffed potato dumplings) or potato pancakes. There’s also a selection of Russian-influenced fayre, including blinis (small pancakes served with various accompaniments). If you’re a lager drinker, try some of the authentic local brews (worth a try even if it’s not your usual tipple) – bitter drinkers will find a decent selection of hostelries serving both Guinness and Kilkenny. Also on offer is a vast selection of wines and spirits – do try some of the Lithuanian vodkas. I found, just around the corner of the Ambassador, a couple of wonderful little haunts which made my stay very memorable. The most exciting of these, by far, was Transylvania, a ‘Romanian’ restaurant which was really just a great pub. It kind of became my local, and I ate there at lunchtime and in the evening, but most importantly it just had a really great ‘pub’ feel. It can and does get really busy, especially at weekends, with Vilnius’s young, student set, but this just breathes extra life into the place. I’m very much a bitter drinker, only drinking lager when forced (ie: when there’s a dearth of bitter), so the fact that this place served Kilkenny suited my palate beautifully. That said, there were some fantastic local ‘lagery-type’ beers on offer too, and these made quite a welcome change, even for me. The food was first class too, offering a selection of Lithuanian and Romanian dishes and some unusual ‘beer snacks’. Most of these went down very well, but think twice before sampling the pig’s ears. They are exactly that and, even if you can get your head around that fact alone, they are nasty tasting bits of gristle – not pleasant at all. I’ll happily eat most things, and will certainly try anything at least once, but pig’s ears should most definitely be left on the pig. I’ll bet even pigs wouldn’t eat their own ears. Lithuania is a beautiful country, and Vilnius a clean and pleasant city. While there’s virtually no litter, spitting does seem to be the national pastime. Vilnius is not particularly threatening, but like all cities it pays to be vigilant. Beware of aggressive beggars – if approached just walk away without making eye contact. Avoid driving if you can – Lithuania has the highest number of road deaths in the whole of Europe, and five minutes in a car will show you why. Lithuanian Philharmonic – for a rare treat, an evening at the Phil is culturally rewarding. Try selecting a piano recital (tickets will only set you back about £4) for a sublime experience that won’t go on all night. The Philharmonic Hall itself is a stunningly beautiful building, inside and out. 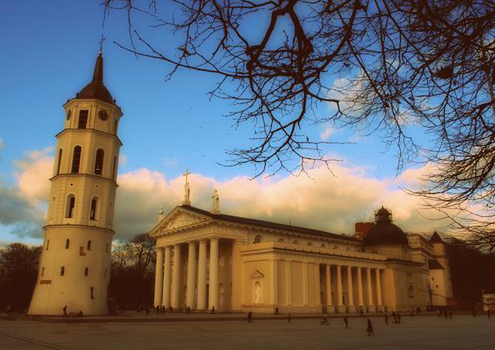 Vilnius City Tour – guides for the tour are excellent, with a fantastic command of English. You’ll get a great insight into the city’s finest features, with plenty of opportunity for budding photographers to snap away. The tours leave Cathedral Square at 11am and 3am and last about two and a half hours. Trip to Trakai – this is an absolute must and makes a superb day out. One of Lithuania’s many former capitals, Trakai, located just 28km west of Vilnius, is a charmingly small settlement, strategically placed in the middle of five large lakes. It is a popular destination for locals seeking a little rest and relaxation by the water and tourists hoping to storm the infamous castle. To replenish all types, Trakai now plays host to many a fine restaurant. Church of Peter and Paul – if you’re not particularly religious, it matters not – a visit to this church must be on your agenda. If you do the city tour, it’s included, but if you don’t, make sure you squeeze this into your programme. A beautiful church, inside and out, it offers much more than you might expect. Museum of Genocide – not for the faint-hearted, but definitely worth a visit. The Lithuanian people suffered greatly at the hands of the soviets, and this former prison tells the story without pulling any punches. Quite chilling and sobering, but well presented and memorable. Radisson SAS Astorija – this is a high-quality, well presented hotel, offering relaxed drinks in the conservatory bar whilst watching the old town go by. Drinks are no more expensive than average, but for a real treat why not sample the restaurant menu? For an evening of culture, you could tag this on to your Philharmonic evening (the restaurant serves until late). For something really tasty, I can recommend the wonderful stuffed cabbage leaves (a Lithuanian speciality) but whatever you choose will be beautifully cooked and presented. Transylvania – a bit of a departure, as it’s a traditional Romanian pub/restaurant. They serve a wide selection of beers, spirits and wines, and a superb menu. Staff are friendly and prices are keen. You’ll find this just off Gedimino Prospekt (on Totoriu 22). Thankfully, there’s not a vampire in sight, either, as the whole place is themed around Vlad Tepes (the impaler). All in the best possible taste, of course. Bar Centro – a nice, relaxed wine bar/bistro. Cheap house wine (but good quality) and a selection of delicious food make this the perfect venue for a chilled, mellow evening. Staff are again friendly and helpful and the surroundings are tasteful and comfortable. An intimate little number situated just up the road from Transylvania. Bar Bobo – it feels as if you’ve stepped into a Victorian funeral parlour, but the gothic atmosphere of this place is absolutely superb. Sit in dimly candle-lit surroundings and enjoy a bottle of Chateau Neuf du Pape if you’re into your reds – it’ll set you back just over £20, but what an experience! Markus IR Ko – a superb establishment in the heart of the Jewish quarter in the old town. By day a relaxing lunchtime treat (try one of their delicious salads washed down with a glass of local cider) and by night a funky jazz bar. Du Drakonai – if you like Chinese food, then prepare for a sublime experience! Hidden away on Labdariu 8, this amazing restaurant is one of the finest I have ever patronised at home in the UK or abroad. The dishes are delicately cooked to perfection and the surroundings are tasteful and relaxing. Great staff, excellent prices and a vast choice of menu make this a must. Busi Trecias – Try this place for its great atmosphere, fine food and home-brewed beers. It makes a perfect venue for either daytime or evening, when the moods steps up a gear. Frequented by locals both young and old, this popular pub/restaurant offers excellent service and very reasonable prices (situated on Totoriu 18). I was about to go on holidays in Poland but I decided to trust you and I visited Lithuania. You helped me a lot and I visited all the thing you wrote about Thanks. Glad you enjoyed it – it’s a really great country, isn’t it?! I agree about the Zeppelins too! I’ll be travelling from Moscow to Beijing on the Trans-Siberian Railway in June, so watch out for my posts on that. Thanks again. Hey again i was away in Lithuania again just for a 3 weeks and i love it again. Yes Lithuania is great. i will look for further news of u about some countries. Thanks to u for this great thing u made. Pleased to hear you had a good time again! Going back to your first comment, have you ever been to Poland? Krakow is great, and Zakopane (in the mountains) is definitely worth a visit. Well i never been in Krakow or Zakopane. But i was in Warsaw. I like it but not much. There was same things as at home. Just buildings little higher. Sa Pedrera d’es Pujol – the best restaurant in the world!